Wanganui Car Dump & Scrap Metal Recycling Centre Oceanview Speedway kicked off the 2010/11 season on Sunday afternoon with a pit full of visitors and a fair sized crowd on the grass banks soaking up the late afternoon sun. With double points on offer, it was a good chance for those on hand to pinch a break on anyone who was a bit slack in getting themselves sorted for the first crack at the season. The track was in good order for the meeting with plenty of water keeping the surface drivable for as long as possible. 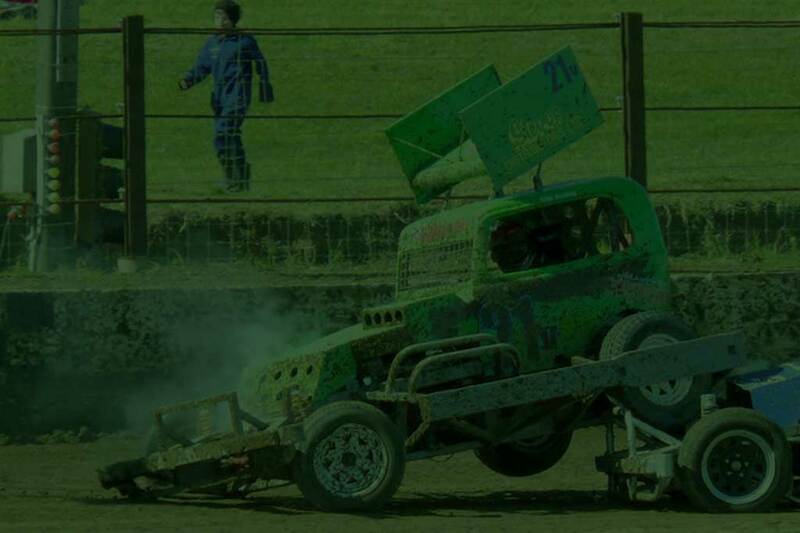 7 cars fronted for 3 races with 10P Peter Rees making a welcome return to Wanganui. He was joined by the 3 locals 5V Darryl Taylor, 23V Scott Duncan & 51V Sam Doyle and 3 Stratford visitors, 282S Phil Ogle, 89S Sandy Flett & 25S Wayne Moss. Rees was all class taking 3 wins from 3 in the Superstocks while finishing 2nd in the Grand Slam where a slicked off track made traction tricky for everyone. In the first race, Rees had to work overtime to nail the local favourite Taylor in the last lap to take the honours. And he repeated the exercise in the Feature when he dealt to the super quick Ogle mid race to take the spoils. Ogle was visibly the quickest all afternoon and a 17.3482 sec lap in the opener had him topping the time sheets. Race One: 1. 10P Peter Rees. 2. 282S Phil Ogle. 3. 5V Darryl Taylor. 4. 51V Sam Doyle. 5. 25S Wayne Moss. 6. 23V Scott Duncan. Race Two: 1. 10P. 2. 282S. 3. 5V. 4. 51V. 5. 23V. 6. 89S Sandy Flett. Feature: 1. 10P. 2. 282S. 3. 5V. 4. 25S. 5. 89S. 6. 23V. A small 10 car field finished off the evening with a derby with a difference where the action took place in the 75m between the chequered flag and the pit gate. With such a concentration of metal crushing mayhem it made for an amazing spectacle. Club Treasurer & Photographer Mike Pollard was right in the mix until the last stanza but the 1 ½ car finally expired leaving Jason Pointon as the victor in his Toyota Celica. All I know is the hits were huge and there will have been a few sore bodies the next day! !